Toyota is to recall 8,000 Tacoma pick-up trucks in the US, over fears about defective front drive shafts. The recall involves four-wheel drive Tacomas built from mid-December 2009 to early February 2010. The move is the latest in a string of recalls in the past few months, totalling more than 8.5 million Toyota vehicles around the world. Previous recalls - including the flagship hybrid Prius - were due to accelerator and brake problems. 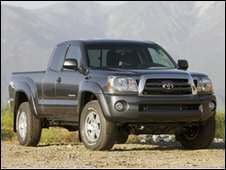 Toyota said it was voluntarily recalling "a small production run of certain 2010 model-year Tacoma 4WD trucks". "The front shaft in these vehicles may include a component that contains cracks that developed during the manufacturing process," the company said in a statement. The cracks could lead to the front driveshaft separating and falling from the truck, causing drivers to lose control of the vehicle. Toyota said it would start notifying owners by mail in mid-March. The shafts were built by engineering firm Dana. The latest recall will come as a blow to Toyota as it seeks to revive trust in its vehicles. Since October, the firm has had to recall millions of vehicles worldwide because of various safety concerns, relating to sticky accelerators, brake faults and problems with floormats. Toyota President Akio Toyoda has previously apologised for the global recalls and pledged to set up a new quality control committee. The Kyodo news agency in Tokyo reported that Mr Toyoda is prepared to testify at US congressional hearings if he is formally asked to do so.